Duane Simshauser is a highly acclaimed mixed media artist. A resident of Fillmore, he works in the genre of assemblage, in which he applies paper and various types of materials to large canvases. Often described as bold and mystical and between order and chaos…with interest in every square inch, Simshauser’s abstract works contain elements of realism that contribute to a narrative. 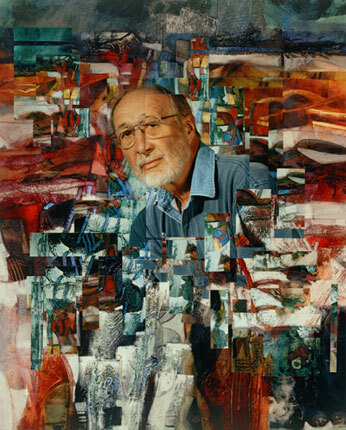 Richly textured and courageously colored, the artist’s award-winning work is widely collected and is housed in numerous public collections including the City of Ventura’s Municipal Art Collection. Simshauser earned a bachelor of arts degree from Eastern Washington University and received his masters degree in Education from California Lutheran University. He continued his fine art studies at Ventura College under the guidance of Gerd Koch. In 1964, Simshauser began teaching 6th grade math in Ventura. Recently retired, the artist is now able to dedicate himself full time to his muse. Duane Simshauser’s documentation took place in 2003. The FOTM Archive contains extensive information about this artist.